Asteroid 4864 Nimoy: Named for Leonard Nimoy. The orbit of 4864 Nimoy. I am pleased to learn that actor Leonard Nimoy has been given a singular honor: The asteroid 4864 Nimoy has been named after him. The asteroid is very roughly 10 km across and is in the main belt between Mars and Jupiter. It orbits the Sun once every 3.9 years. Oh, how I wish it had a seven year period! Its orbit is very slightly elliptical (Spock would no doubt inform you that it has an eccentricity of 0.1778108147152254, with a 1-sigma uncertainty of 6.3351e-08), and orbits the Sun in almost the same plane as Earth. It was originally discovered in 1988. In the orbital diagram above, I chose to display the position of 4864 Nimoy on the date of his death, Feb. 27, 2015. Leonard Nimoy (1931-2015) was an American actor, film director and poet. Best known for his portrayal of the half-Vulcan/half-human science officer Spock in the original “Star Trek” TV series and subsequent movies, Nimoy wrote two autobiographies: I Am Not Spock (1975) and I Am Spock (1995). 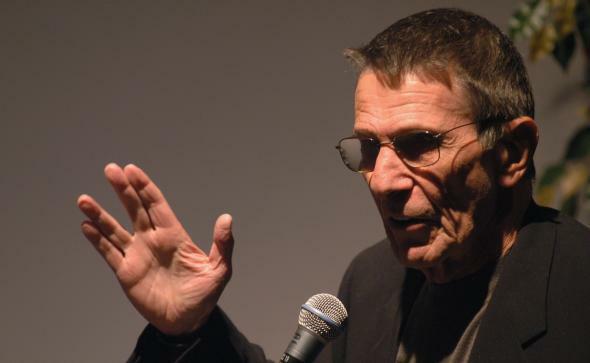 @RonBaalke @BadAstronomer @TheRealNimoy @WilliamShatner Anagram of the day: Leonard Nimoy = Alien dry moon. Heh. Ironically, it may not be as dry as all that. At that location in the asteroid belt there’s some chance of ice inside Nimoy. And another layer of irony: Some people may think that Vulcans were incapable of emotion, but in fact they felt emotions even more strongly than humans; they just kept them more tightly under control. It wasn’t ice under Spock’s skin, it was barely constrained lava. And I have to wonder. Sometime between now and the 23rd century, will we have visited this mountain-sized rock? And in that (hopefully promising) future, will Star Trek still be the inspiration it is for so many today? I hope so. May its, and Nimoy’s, legacy live long and prosper.